If you remember the Nexus Prime render from a while ago, now you have something to compare it with. I’m talking about the design below, created by Deviantart member hsigmond and dubbed mYNeXus. The curved design from the Samsung Unpacked event teaser is kept and the leaked screenshots with Ice Cream Sandwich have been put to good use on the screen. 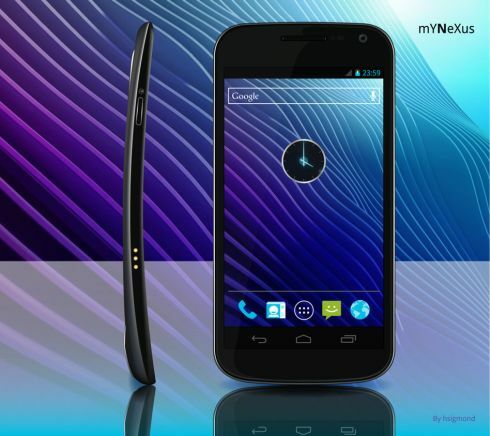 If you want the real info on this handset, the Galaxy Nexus is going to be announced on October 19th in Hong Kong together with the new Android. Rumors say that it will retail for $700+ and as you can see it will lack physical buttons, replacing them with the virtual ones from Honeycomb. I expect here a waistline of under 8.5mm (Galaxy S II thickness), at least 16GB of storage and a dual core 1.2GHz CPU at least, maybe a 1.5GHz one even.